In the mid-90's, as I continued to explore the mind-body connection further and further, I began shifting the focus of my healing practice away from physical injury and illness toward personal fulfillment—inside the context of body energetics, spirituality, and consciousness. By that time I had been actively engaged in the practice of bio-energetics, studying polarity therapies and meditating, as well as exploring a range of esoteric sciences including numerology for seven years. While something definitely attracted me to numerology, I felt it was all too formulaic, assigning the number 1 to the letter A, 2 to B, 3 to C, and so on up to 9, starting over again with the letter J. At the time I didn't have a concept of numbers as anything other than mere quantifiers. 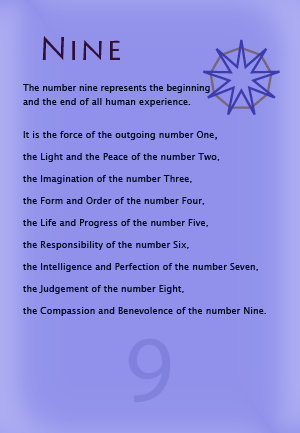 So I said to Spirit, "If there really is something to numerology, then I ought to somehow be able to feel or sense these numbers and their inherent qualities in the letters." Not long after that, as I walked back to my office from my lunch break—in downtown Chicago—a flood of energy started coming in through my crown chakra. I stood there on the sidewalk, unable to move as people walked by, until it was done. When it was over, still somewhat in a daze, I continued back to my office and noticed that when I looked at street signs a number would suddenly spring to my mind as I looked at the letters. Seven from the "p" in "Stop," six from the "x" in exit. I found myself compelled to say them out loud, "three", "one", "nine", calling out the numbers as I encountered different signs all the way back. While I've done a lot spiritual work and experienced a range of altered states, this was strange even for me. If this weren't already unusual enough, when I got to the office, my office partner who always comes in was absent. And my two o'clock client was late. At quarter past the hour I figured he wasn't coming and I began looking at the picture I had hanging on my wall of Egyptian hiergylphs taken from the tomb of a physician to a pharoah. I found my attention being drawn to the upper right corner, captured by the two eyes and drawn deeply into them. (I later learned that these were associated with the Eyes of Horus.) At this point I paused to check in with Spirit to be sure this was right for me, a practice I'd developed before undertaking any deep spiritual exercise. Once I felt sure this way safe, I released myself into the process, most of which involved assuming various postures, looking at the hierogylphs, then being led to pick up and open different books. In this state however, I couldn't focus on the words enough to read them, instead I found myself running my fingers back and forth over the letters. At one point, I realized it must be getting close to three o'clock and my next appointment, so I pulled myself out of the process. But this client too was a no-show. By now I felt that somehow this had all been "arranged." I resumed my spiritual journey, returning again to the hierogyphs, at times adopting a new posture, then looking at more letters in posters on the walls, magazines, and books. I was trying to understand what I was doing, when it occurred to me that I was feeling the resonance in the letters in as many different fonts as I could find. When it was over it was after 4:30pm and time to go home. This experience was the beginning of a 3-year evolutionary process for me that involved hundreds of hours of altered states and led to the activation of a range of multi-dimensional faculties. During this time I was also training in a transformational process called Geotran, a field language (expressed through numbers while circling your hand over different spin points on the body) for reeducating oneself multi-dimensionally. Through my spiritual experiences and extensive use of Geotran, both personally and professionally, I began to perceive various orders of the information field and the dynamics for composing a resonant pattern or inaudible "song" that would effect change at this level of reality—where thoughts, beliefs, and the resonant signature of our emotionally charged experiences are stored. While Geotran taught me a preset language to change this level of reality, I began to formulate a grammar, or set of rules, for composing my own repatterning codes. I went on to develop this grammar in the late-90's and named it Ixion (pronounced eesh-eon). It was my work with Ixion that formed the foundation for my ability to develop Raydiant Lightware.